From Mo i Rana, drive about 38 kilometer south on E-6 to the small community Korgen. Make certain to find Hwy. 806, the turnoff is after you have passed the Gas station and then driving under an overpass. Turn left onto Hwy 806 here and drive 22 kilometer on Hwy. 806 to Bleikvasslia. Turn right here, the sign says Hwy. 73 and Hattfjelldal. Continue 18.5 kilometer from Bleikvasslia. The road descends gently to a low point, just at the end of a narrow part, Sørbukta, of lake Tustervatnet (on your right hand side). This is just south of Storneshaugan (463m). There is parking on the left side of the road. Park here, location N65.79229, E013.88529, elevation about 400 meter. 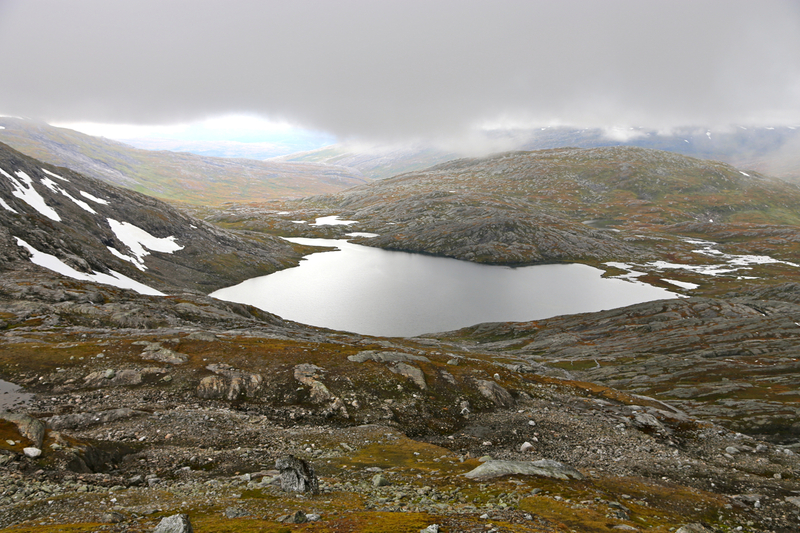 The route runs north on the west side of lake Tustervatnet. There are several pretty open areas among the trees. A number of creeks have carved local (tiny) valleys that must be crossed, no problem really. The cliffs above on your left are pretty rugged. Continue until they end, at this point descend slightly, then climb a short, steep hill in order to gain the terrain above. Cross the small valley with the creek from lake 769. Continue uphill on the slope that climbs to the area just west of lake 965. This description will be completed later (when I climb the final section). From the plateau north-west of lake 965, one should ascend the steeper slope directly west, ascending about 300 vertical meter. In summer, this is not very difficult, starting out near the north end, one may easily find grass ledges and smaller gullies that run uphill. There are smaller cliffs and more slippery (when wet) rocks scattered all around, but the good terrain connects in various ways. Most likely, it is easier to gradually move further left (when facing uphill) as you ascend. The terrain gets easier higher up. Slightly above 1300 meter, the best route heads up the main ridge (the north ridge) of Geittinden. This ridge gets more horisontal higher up and turns into a small sequence of false summits / bumbs. One of these even has a significant cairn (should be destroyed! 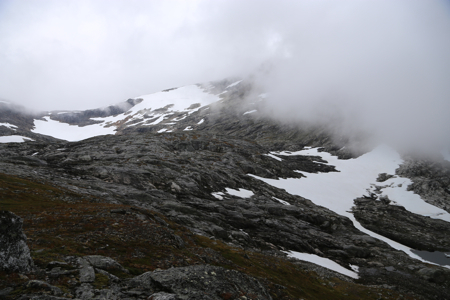 ), shortly thereafter you reach a more triangular shaped summit area with the highest point and the main cairn located at the east (left) side. November 2012: After a very successful climb of Ølfjellet yesterday, I drove to Mo i Rana and enjoyed a bit of luxury at the nice Rica Meyergården hotel. I left around 0700 and my goal was to start not too long after 0800. However, this was not to be. I turned left off E-6 in Korgen and did not realize that I took Hwy. 322 into Leirskarddalen instead of Hwy. 806. This was 20 kilometer of extra (wasted) driving. I finally arrived at the trailhead, but the time turned 0900 before I was ready to ski. The weather was completely overcast, a light brezze, but overall pretty good. The snow was wet and breaking trail was fairly cumbersome. Still, I made reasonable progress as I gradually climbed towards the steeper rocks above. From here, one can see back to the trailhead with the car. My hope was to turn the corner at the north end. 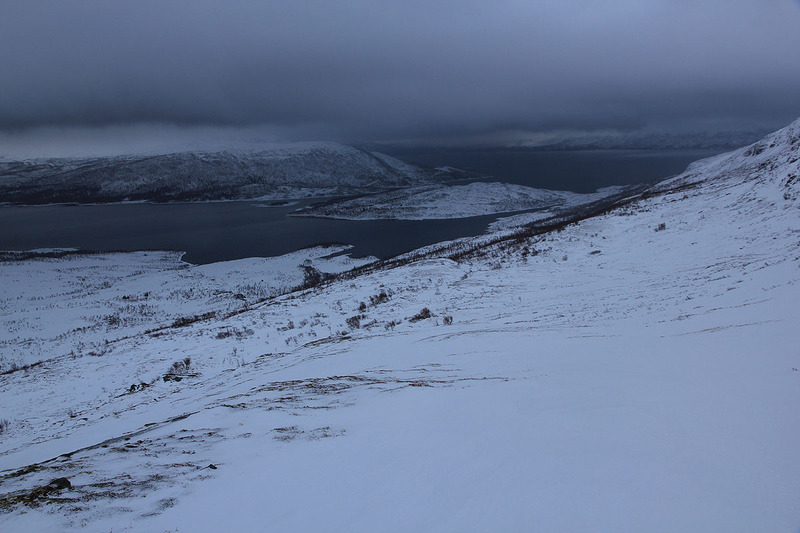 Arriving there, things looked a bit worse, but after a short descent I found a steepish, but short snow slope that got me to more level ground. Another really bad problem, my skins (under the skis) accumulated enormous amounts of sticky, wet snow. It did not help to scrape them clean. I took the skins off and applied some blue-red wax. It slipped or got equally sticky. 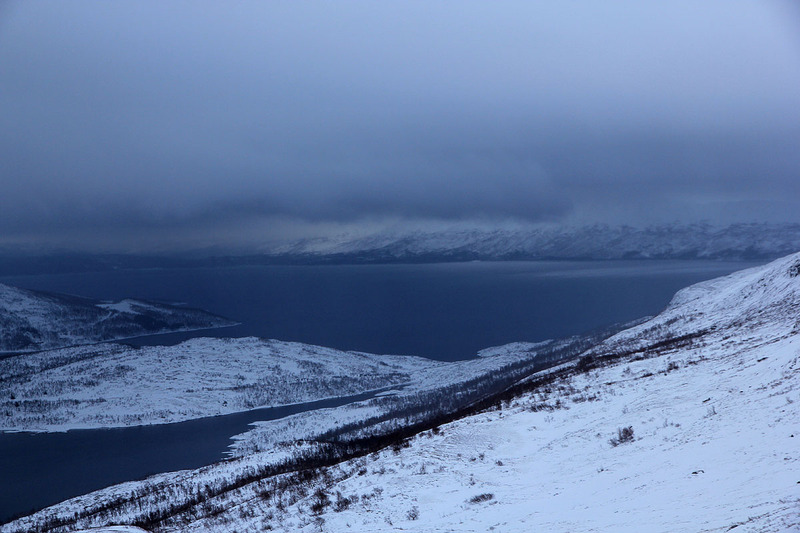 The temperature had increased and the air was full of a mix between rain and snow. This is about as bad as it can get. As I crossed higher, with lake 769 down to my left, the terrain was kind of rough. I had white-out conditions and ran across a couple of smaller snow drifts without seeing them until I was just there. Bad, especially if coming back down with beginning darkness. I stopped, to consider my options. The time was 1200, it had taken me 3 hours to get here at elevation 860 meter. I had 2.5 kilometer left with 700 vertical meter, some of it quite steep, crampons for sure. The overall weather situation was getting worse. After a careful evaluation, I decided to turn back. 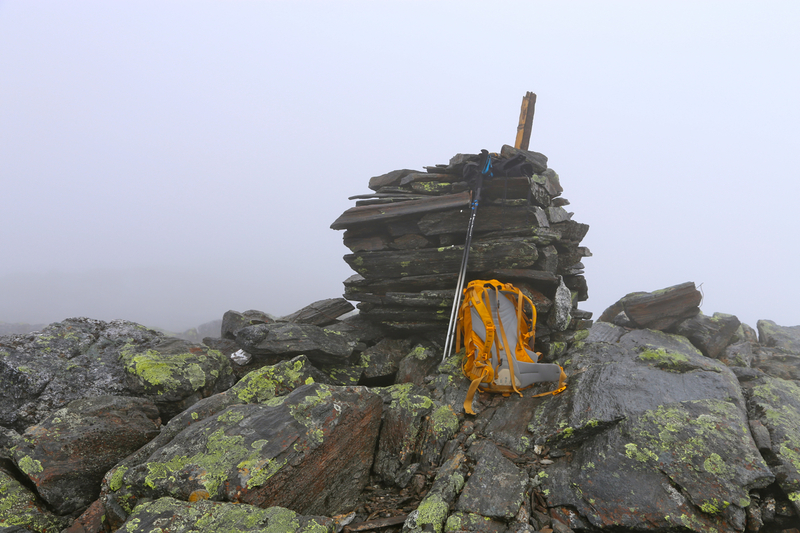 I reasoned that climbing the steep north ridge of Geittinden with no visibility would be difficult. Too bad, just the driving would be about 350 kilometer with no summit. Yes, distances are considerable. I would need to retun to the Lønsdal DNT hut where I would meet Åke tomorrow morning. I skied back without any trouble, hitting the car at 1345, ie. the return trip took 1:30, just half the ascent (breaking trail) time. I shall be back. September 2015: After a very nice and sunny day where Åke and I succeeded to climb the only Norwegian Ribus (Prominence exceeding 1000 meter), that had no previous ascents, we drove south to Saltfjellet and stayed overnight at the Lønsdal DNT hut. Getting up at 0500, we started driving early and arrived at the trailhead/parking around 0800. The weather was not great, overcast, but no rain. We started hiking at 0815. The plan was to walk together until shortly before the mountain. Since Åke had already climbed this peak, we would then split and Åke would traverse (and climb) two peaks, Litltinden (1256m) and Kjerringtinden (1395m). I would then pick him up about 5 kilometer further down the road. The ascent was pretty easy, despite wet rocks and wet moss making things pretty slippery. I zig-zagged up the slope following vegetation and places with rocks, avoiding the slick rock. Most of the terrain sloped uphill from left to right, but there were several spots where one could also ascend left making the overall direction pretty staright up. Higher up, the terrain was less steep and I turned more left and followed the main ridge (with steeper terrain on my left) uphill to the final, more flat summit ridge. This final sections had several false bumps that looked like the summit in the fog. One even had a pretty big cairn, not good as it could mislead people. Shortly thereafter, I arrived at the main summit. The time was 1200, and visibility rather limited. I took a Kvikk-lunch (chocolate), but headed back down after about 10 minutes. As I was walking back along the top ridge, I noticed blue sky above and the fact that the clouds were really below me. Subsequently it briefly cleared and I could see more landscape around and below. This did not last more than a few minutes. The descent was nice, with no particular issues. I made a brief stop at the small crest north of lake 769. 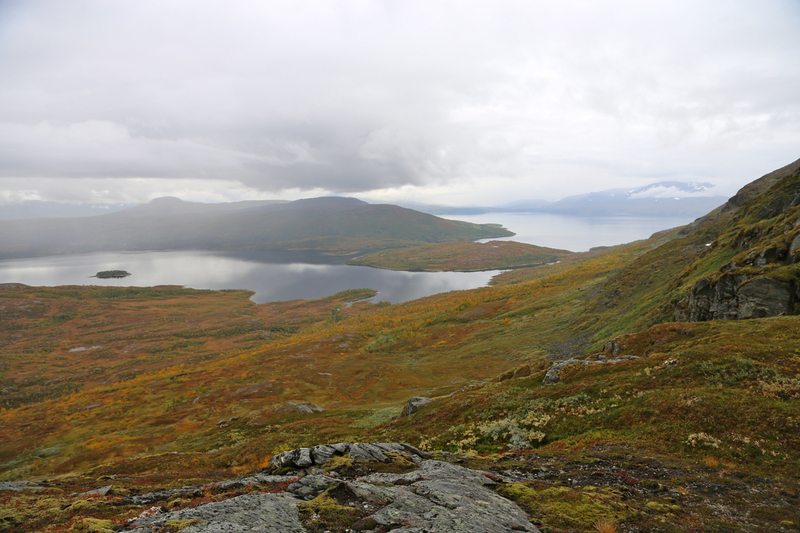 The view was now good (under the clouds), and the big lakes could be seen stretching out in the wide landscape. I was back by my car at 1530, drove about 5 kilometer further along the road and recovered Åke at 1600. View back, the trailhead is close to the end of the inlet. View back, similar pic, this is September 2015. Lake 726, located north of Geittinden (not on the route).